My niece and I bought it at INFO MAX at cyberzone 4flr. in Megamall just yesterday (Sunday). Actually, I went to Canon branch 1st at megamall but it is out of stock and it costs more that what i got from Infomax. I know it is much more cheaper in Hidalgo but I have no time to go there anymore. Have you got your own, Canonians get one now as it is a must!! My next project is either 28-135 mm IS or telephoto 70-200mm IS lenses. Yay expensive hobby! 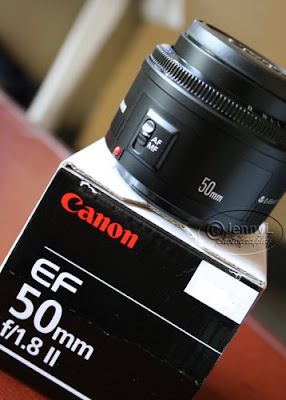 Go get your nifty fifty lens now! ang bongga! hehe! di ba maghirap matutunan yong settings te jen? yon ang concern ko eh. masyado akong tamad pag-aralan if ever bibilhan ako ni hubby ng DSLR. Hi Ate Jen, thanks for stopping by. Wow, grabe congrats sa new lens. Iba na talaga ang mga pro ngayon hehe. I'm okay here, but si little boy may fever. He just had his "first shot" yesterday kaya siguro nagka ganon. Kaya ito, napupuyat hehe.